On this snowy day, I’m recalling some recent conversations with friends asking what exactly am I eating that is fresh and local in this kind of weather? So, I made a list. I consider food that I grew last summer and preserved in some way fair game when making such a list but italicized them below so you can tell what’s ‘fresh’ and what’s ‘preserved’. All grown or available right.here. Here’s what we’re eating these days: corn and corn meal, cilantro, tomatoes-yes, we’re still enjoying fresh Longkeeper tomatoes harvested in October-cabbage, broccoli, beets, parsnips, white potatoes and sweet potatoes, green beans, kale, parsley, herbs, butternut and spaghetti squash, pesto, salsa, dried beans, jams, V-8 and grape juices, peas, edamame, jams and jellies, honey, teas, hot sauces, salsa, flour and corn tortillas, corn bread and yeast bread, apple sauce, carrots, strawberries, blackberries and blueberries, onions and garlic, molasses, and peppers and occasionally eggs, goat’s milk or goat cheese are given to me by friends. We also had fresh lettuce until just recently but the cold finally did it in, mostly due to our failure to protect it well. We enjoy stir fries, soups, pasta sauces, and one pot meals most of the time, occasionally splurging on a pizza from Main Street Pizza since they grow their own toppings on their nearby farm. There are lots of other local foods available that we occasionally enjoy but don’t grow ourselves-from wheat for grinding into flour, to pumpkins, meats, cheeses, apples, pears and other fruits. I suppose most any food you might want can be found locally at some time of the year anyway! (OK, oranges and seafood excluded, but certainly some kinds of fish are available.) Rice, olive oil and spices are my main import exceptions, although rice is being grown in South Carolina now and I hope to buy from there this year. How far does ‘local’ go? That’s for you to define. Some say 100 miles, others feel 250 is still local. 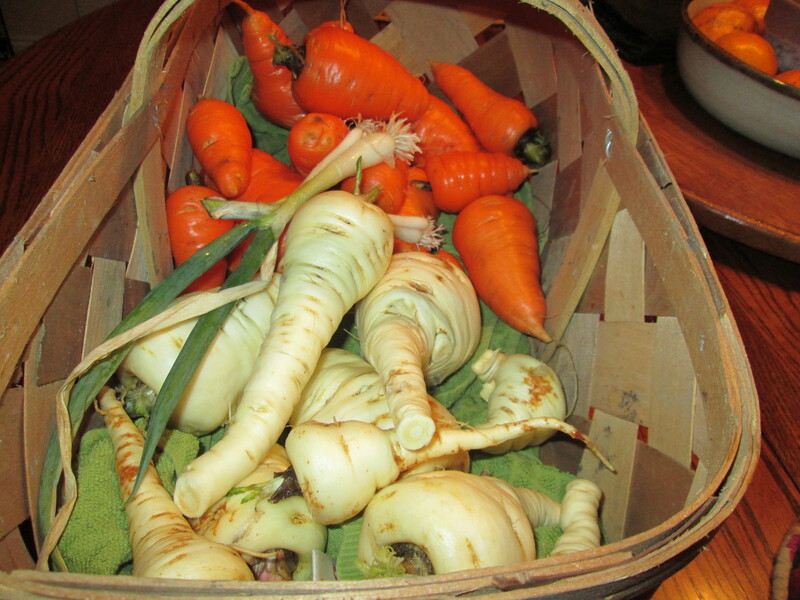 And why does eating local foods matter so much to me? Less travel: Local food travels much less distance to market than typical fresh or processed grocery store foods, therefore using less fuel and generating fewer greenhouse gases. More freshness: Local food is fresher, healthier and tastes better, because it spends less time in transit from farm to plate, and therefore, loses fewer nutrients and incurs less spoilage. New and better flavors: When you commit to buy more local food, you’ll discover interesting new foods, tasty new ways to prepare food and a new appreciation of the pleasure of each season’s foods. Good for the soil: Local food encourages diversification of local agriculture, which reduces the reliance on monoculture—single crops grown over a wide area to the detriment of soils. Attracts tourists: Local foods promote agritourism—farmers’ markets and opportunities to visit farms and local food producers help draw tourists to a region. Builds more connected communities: Local foods create more vibrant communities by connecting people with the farmers and food producers who bring them healthy local foods. As customers of CSAs and farmers markets have discovered, they are great places to meet and connect with friends as well as farmers. So, I’ve told you what I’m eating these days and why. Now I’ll leave you with a little pictorial of what we’ve been enjoying at my house…are you eating any local foods that aren’t pictured here? Am I missing anything? I really enjoyed the rainy weather here in NE Tennessee last weekend! It got me OUT of the garden and IN-to the kitchen. I finished canning the last of the green beans and cooked a pot for supper, along with those little, teeny, tiny Yukon gold potatoes that you just have to wash- the skins are so thin that no peeling or cutting is even necessary. Most people don’t bother to harvest those babies→ but I gather them all up when we dig our crop, right along with the big ones. I throw ’em right in the pot with the beans, chopped onions and a dash of bacon grease. The beans and baby taters, along with our very first ears of Kandy Korn from the corn plot down at the community garden, fat slices of heirloom Cherokee Purple tomatoes and grilled garlic bread along with a sliver or two of the leftover rotisserie chicken I splurged on earlier this week make a frugal, dee-li-shus supper with very little prep time. I also used eggs from my friend’s backyard flock to make deviled eggs as well as bowls of potato salad and cole slaw that made good use of our home-grown cabbage, carrots, potatoes, red onions and herbs. We enjoyed the salads with our salmon/cucumber sandwiches for lunch today and have enough left for several more meals. Good golly Miss Molly, we’re eatin’ good these days! Most of my readers know that I live downtown and am excited to be a part of the urban revitalization that is taking place in my community. For two years, the very premise of this blog has been about finding ways and means that will enable us to transition, gracefully if you will, to a lifestyle that is more sustainable, resilient and fulfilling than the one that we find ourselves in today. It’s about re-creating our future in ways that are not based on cheap, plentiful and polluting oil but on localized food, sustainable energy sources, resilient local economies and an enlivened sense of community well-being. For me, the good life involved moving from our acreage in the country to an urban area with high walkability, a nearby community garden, and where I can work alongside my neighbors to help ‘be the change I want to see’. What I discovered this afternoon is all that. 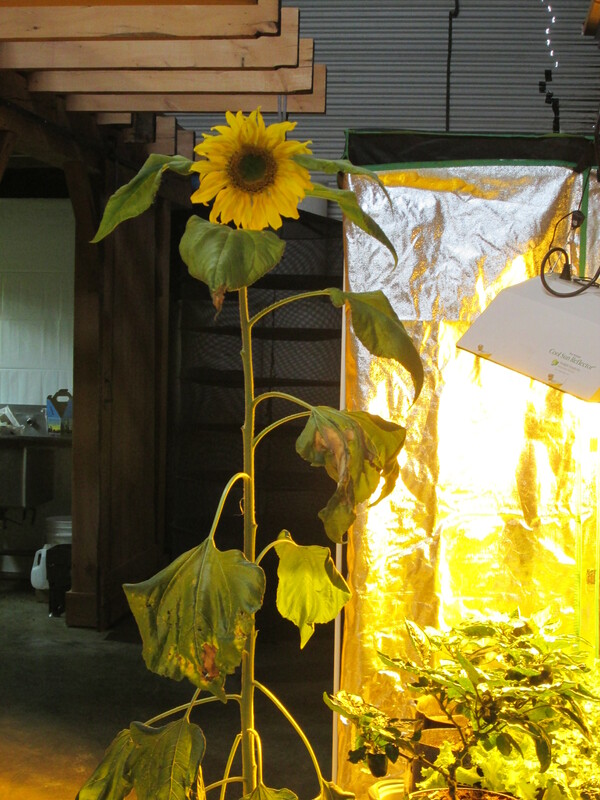 A 5 foot tall blooming sunflower, along with fully grown peppers, lettuces and tomatoes were all growing there in the confines of those brick walls! We bought a package of sage seeds from Seeds of Change but they also had a full rack of heirloom seeds from Sow True Seed Company, from nearby Asheville, NC. I could see this store becoming a wonderful replacement for the recently-moved Mize Farm and Garden store, minus the poisons. They had growing pots and trays for sale, but could use some tools and a few more familiar gardening needs to fill that niche easily. I hope you’ll pay them a visit, support their early efforts and let them know what you’d like to see them stock. I think they’re ‘all ears’ and might be willing to fill the empty spot in our hearts and gardens that Mize once occupied. ‘Downtown Farming’ indeed! Those two little words embody the very essence of this blog.